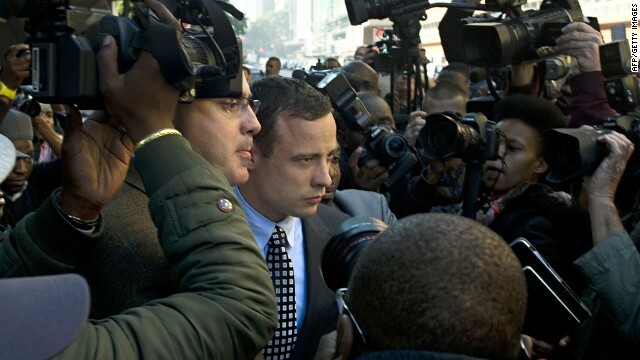 With his murder trial approaching this March, South African Olympic runner Oscar Pistorius has hired some help from the United States to challenge the case against him. An American forensic team will give expert testimony to cast doubt on evidence entered against the athlete nicknamed the "blade runner" for the special prosthesis legs he sprints with, his spokeswoman Anneliese Burgess said Wednesday. The track star, whose legs are amputated below the knees, admitted to shooting dead model Reeva Steenkamp, in his home on Valetine's Day. But he has said it was an accident. She was 29 when she died. A business jet crashed into a hangar at the Santa Monica Airport on Sunday. No one survived the crash and subsequent fire, but authorities did not immediately determine how many were on board. The twin-engine Cessna Citation ran off the right side of the runway after landing at 6:20 p.m. PT, said Federal Aviation Administration spokesman Ian Gregor. We've all heard the dictum: Don't text and drive. Now, a New Jersey state appeals court has an addendum: Don't text a driver - or you could be held liable if he causes a crash. Kyle Best was behind the wheel of his pickup in September 2009 driving down a rural highway, when Shannon Colonna sent him a text. The two were teens at the time. He was 18; she was 17, and they were dating. They sent each other 62 texts that day, according to court documents. That's 14 messages an hour. In the opposing lane of traffic, David Kubert was cruising along on a big, blue touring motorcycle with his wife Linda along for the ride. They approached Best at exactly the wrong time. Leaking gas was likely to blame for an explosion that killed at least 12 people, injured 60 more and brought down part of a building in Argentina on Tuesday, state media reported Wednesday. A man who was working at the scene in the city of Rosario before the blast ignited at 9:15 a.m. local time has been taken into custody, said the Telam news agency, which cited investigator Juan Curto. The explosion gutted one multi-story residential building, and destroyed at least one other building next to it, while blowing out the windows of surrounding structures, images broadcast by CNN affiliate Canal 9 showed. A train heading toward New York derailed, then hit a train going the other way, according to a transit official. Two Metro-North passenger trains heading in opposite directions collided during rush hour Friday evening, damaging both trains and leaving some "bloody" and wounded as a result, a witness and transit official said. 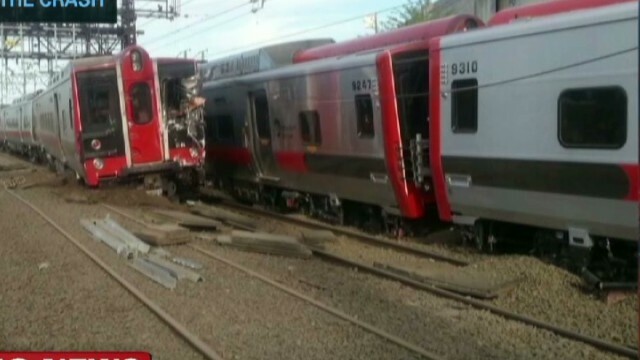 A train heading from New Haven to New York City derailed around 6:10 p.m., hitting the other train in Bridgeport, Connecticut, Metro-North spokeswoman Marjorie Anders said. That caused some cars on the second train, which was destined for New Haven, to likewise leave the tracks. Two Bridgeport hospitals were treating dozens of patients, three of whom were in serious condition, officials said. At least nine people were killed Thursday evening and more than 40 were injured when a building collapsed in Thane, India, sources told CNN sister network CNN-IBN. The seven-story building was under construction and was illegally occupied on the first four floors, Mumbai Suburban District Deputy Collector Manoj Gohad told CNN-IBN. The Carnival Cruise ship Triumph is undergoing repairs at a dock in Mobile, Alabama. 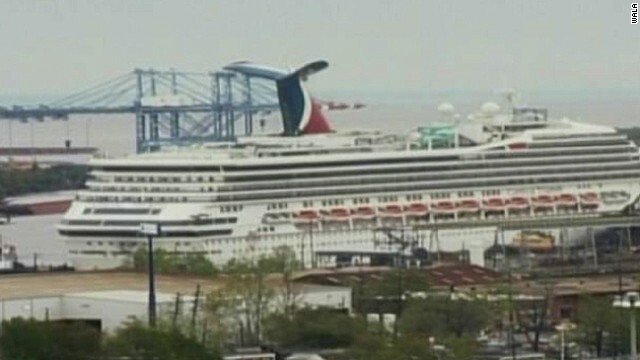 One person is missing after high winds in Mobile, Alabama, caused the disabled cruise ship Carnival Triumph to break loose from its dock. There were conflicting reports as to where the missing man was working. Filed under: Accidents • Alabama • Travel • U.S.
A disabled tanker ship struck a bridge linking Portsmouth, New Hampshire, and Kittery, Maine, on Monday, closing the heavily used span to traffic. The 470-foot Harbour Feature was carrying tallow oil when it hit the aging Sarah Long Bridge stretching over the Piscatagua River. The crew of the Portuguese-flagged ship reported a rupture of up to 12 inches above the waterline, the Coast Guard said. But there was no indication of any leaking cargo. Filed under: Accidents • Maine • New Hampshire • U.S.
A gas explosion at a northeastern Chinese coal mine killed 28 people, China's state-run Xinhua news agency reported Saturday. Thirteen people were rescued following the incident, which happened Friday, according to Xinhua. The blast occurred in the northeastern Chinese province of Jilin. A U.S. Navy SEAL was killed and another was injured in a training accident in Arizona, a U.S. Department of Defense official said Friday. The SEAL who was killed belonged to SEAL Team Six, the elite squad from which a team was selected to go after Osama bin Laden in Pakistan two years ago, a source said. The accident occurred Thursday at a U.S. Special Operations Command parachute testing and training facility at Pinal Airpark, Arizona. The SEALs were transported to the University of Arizona Medical Center, where one remains hospitalized, the official said. 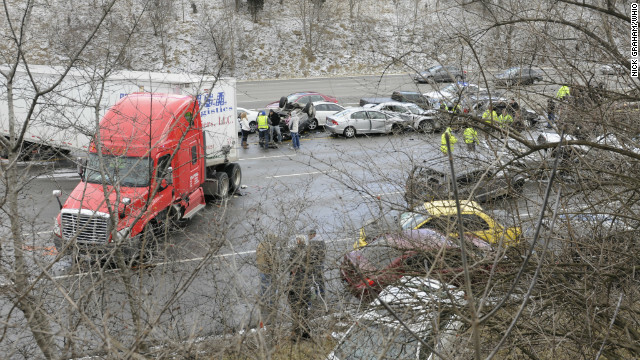 The accident is under investigation, the official said. About 100 people suffered minor to moderate injuries in a multi-vehicle crash Thursday south of Edmonton, Canada, Alberta Health Services said on its Twitter feed. According to official road reports, a snowstorm has made the roadways extremely dangerous. The snowy conditions and smoke from multiple crashes caused by those conditions have resulted in delays of six hours or more, reports say. Snow plow trucks have been pulled off of the roadway because of poor visibility. Alberta Health Services, Alberta's provincial health authority, lowered its initial estimate of 300 injuries in the pileup in Leduc, south of Edmonton. Most of the injuries were minor, it said, with six considered moderate and one serious. 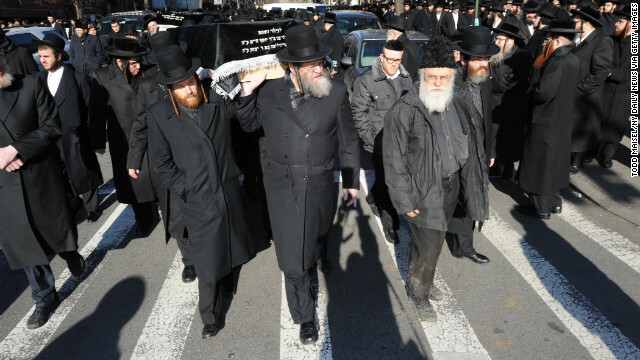 Hasidic Jews in New York march in the funeral of Nachman and Raizel Glauber on March 3. Julio Acevedo, the man accused in a Brooklyn car crash that killed a Hasidic couple and their child earlier this month, pleaded not guilty Thursday to second-degree manslaughter, criminally negligent homicide and leaving the scene of an accident. Acevedo remains in custody; no bail has been set. Souls rose to heaven symbolically Monday night, when marchers in this southern Brazilian town remembered those who perished in a nightclub inferno during a packed concert. The mourners, wearing white, released 231 white helium balloons into the sky - one for each life lost. They hope there won't be more. Eighty three more victims lie hospitalized - 75 of whom could forfeit their lives to the severe burns and smoke inhalation they suffered when the Kiss nightclub went up in flames Sunday, authorities said. [Updated 3:10 a.m. ET] Another construction worker was rescued from the rubble early Thursday morning, Miami fire officials said. But in order to get the man out of the collapsed garage, medics had to perform a double amputation. Authorities believe there is one more victim trapped in the massive debris. [Updated at 9:22 p.m. ET] Three workers have died and one remains trapped in rubble after a parking garage under construction collapsed in Doral, Florida, according to the Miami-Dade Fire Rescue Department. Eight people are hospitalized in Miami-area hospitals, according to a statement from Miami-Dade Fire Rescue. It did not identify them or give their conditions. [Updated at 4:08 p.m. ET] One person died and at least two other people were trapped when a parking garage that was under construction collapsed in Doral, Florida, Miami-Dade Fire and Rescue told CNN. One of the trapped survivors was freed. He was critically injured, Miami-Dade Fire and Rescue spokeswoman Griselle Marino said. "We have our surgeon working on [him] right now," Marino said. Marino said dogs are looking for one or two more people who could be trapped. Eight people have so far been transported to a hospital, she said. A passenger who tumbled about 1,000 feet from a hang glider to her death in Canada fell because she wasn't strapped to the craft and because the pilot failed to ensure attachment before takeoff, according to an investigation by a gliding industry group. Pilot William Jonathan Orders, who previously was charged on suspicion of swallowing a possible video recording of the flight, didn't perform a required "hang check" that would have revealed Lenami Godinez-Avilla wasn't attached to the glider, the Hang Gliding and Paragliding Association of Canada (HPAC) said this week. Godinez-Avilla, 27, fell to her death on April 28, not long after she and Orders took off from Mount Woodside over a heavily wooded area near Agassiz, British Columbia, authorities have said. "A review of the events leading up to takeoff suggests that there were multiple distractions that may have resulted in a breakdown of standard operating procedures," said the HPAC's report, which cited witness accounts and its examination of the glider and equipment. Orders, 50, was charged in May with attempting to obstruct justice on suspicion of swallowing a memory card of an onboard video camera that might have recorded the flight, an action he said he admitted doing. Orders passed the card while in custody days later, and the Royal Canadian Mounted Police (RCMP) said Thursday that they've viewed the card's data but aren't discussing the contents.